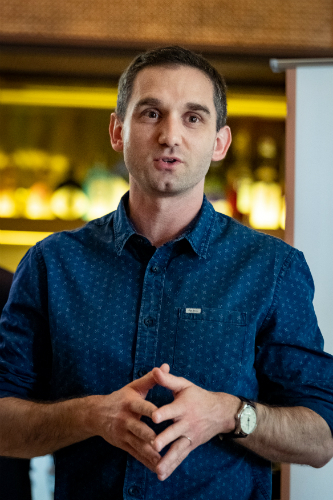 Fifth generation of the Giffard family and COO of the Giffard company, Pierre Jouanneau-Giffard was recently in KL to judge the Giffard West Cup Asia Finals 2019 – his first time in Malaysia, and his second time judging a GWC competition. He got off his flight from France an hour before ThirstMag sat with him for an interview, but his mood and his expectations for the next day’s competition were equally high. “I know there was a huge pre-selection all over Asia,” he says about the more than 250 recipes that were uploaded to Instagram under the hashtag #giffardbluemymind as part of the GWC Asia pre-selection round, “I expect a very high standard”. But his work here isn’t limited just to the competition. As Jouanneau-Giffard’s day-to-day role in the company is more on the production side, this gathering of nine bartenders (plus the first runners up from each of the national competitions) would act as guinea pigs in an R&D workshop led by him and the Asian team to work on some new flavours Giffard is creating for the Asian market. “It’s not something we do every month because it’s a huge investment, but it’s something we really want to develop. We’ve already done this two years ago here in Asia and this allowed us to select some new flavours we’ve launched a few months ago.” While he remained tight-lipped about what the flavours were, and the workshop was strictly private and confidential, he did share there were nine samples he had brought from France. This is also why Giffard is so attuned to the palates of the bartenders on the ground, so they can capitalise on the taste trends of the moment. This was the case with the recently launched and incredibly successful Caribbean Pineapple Rum liqueur, which was conceptualised to take advantage of the ongoing tiki revival happening in key markets where Giffard operates (namely America, Europe, and also in Asia). Jouanneau-Giffard calls it “an interesting flavour to work with” that’s a perfect balance of pineapple (“but not too juicy”) and a good Caribbean rum that’s captured the imagination of bartenders around the world. “We try to launch several creations every year so we stay innovative, and not to be followers of this market,” Jouanneau-Giffard says proudly. So while the new flavours remain under wraps, we remain on tenterhooks for the eventual reveal. Giffard West Cup Global Finals will be held in Angers, France – the birthplace of Giffard – on 28th May. Malaysian Shirmy Chan is one of the top three finalists from Asia and will represent Malaysia at the event.